Future concerts in planning...Stayed Tuned..
our 4th Annual Holiday Concert such a success! 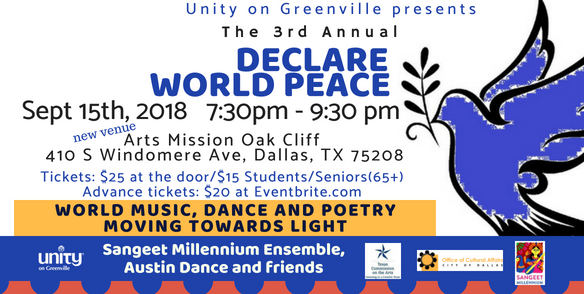 Arts Mission Oak Cliff, presents the Third Annual Declare World Peace Celebration of Global Music, Dance, and Poetry, for International Peace Day 2018. In remembrance of the dark chaos due to war, intolerance, hate, fear, polarization of people, and environmental calamity occurring both globally and locally, all the performances in this concert embrace the theme "moving towards light," as the artists collectively seek to create and hold a space of love, respect, and safety, and positive change. This family-friendly event is supported in part by grants from City of Dallas Office of Cultural Affairs and Texas Commission on the Arts. This exciting multicultural, multidisciplinary, and multilingual concert features the critically acclaimed Indo-jazz-world fusion project Sangeet Millennium Ensemble, led by Dallas-based sitarist Amie Maciszewski, and with members from Dallas, Austin, and Denton. They collaborate with an international cast of expert performers: Austin Hall of Fame Artist Anuradha Naimpally's exquisitely innovative Bharata Natyam-based ensemble Austin Dance India (with whom they will present their performance installation "Moving Towards Light"), the ever-new music ensemble Impending Bloom, the lively Jamal Mohamed World Ensemble, the sinuous Afro-beat Hathor Experience, Jacco Velarde's delicately haunting Vision Andina, and the charming young voices of the Bhutanese Refugee Student Mandali. Arts Mission Oak Cliff Children under 10 FREE! What happens when you combine inspiring music and visionary art? A unique experience of alchemy you’ll not soon forget! Prepare for your heart to ignite and awaken as you witness Visionary Artist Pete Taboada infuse the deeply inspired music of Bhakti House Band into a live painting, right before your eyes! You’ll not just hear the music, you’ll watch it come alive on canvas. People who own a piece by Pete Taboada describe the process of his work as magnificent, unique, and one-of-a-kind. Pete is inspired by the love and creative energies that unite us. His art reflects his path toward the divine wisdom of love and connection with all life. His intention with every painting is to radiate and reflect the beauty and passion of the individual and collective souls of humanity. Led by Texas mantra musicians Randall and Kristin Brooks, Bhakti House Band presents an East-meets-West fusion of percussion-driven instrumentation and rich harmonies that enlighten the soul. Combining Sanskrit mantra and kirtan with inspirational English lyrics, Bhakti House Band creates a sacred space where listeners can surrender their minds to the rhythmic groove of the heart. 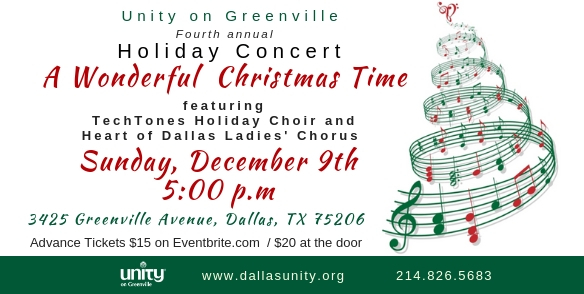 Parking at Unity on Greenville ~ You can park along the street on McCommas, Morningside, Martell, Mercedes, and Penrose. The "No Parking" signs have time and date, notice Weekend 9pm.